A tree planting ceremony on Rapa Nui (Easter Island) has celebrated the life of renowned Massey University geography Professor Dr John Flenley. 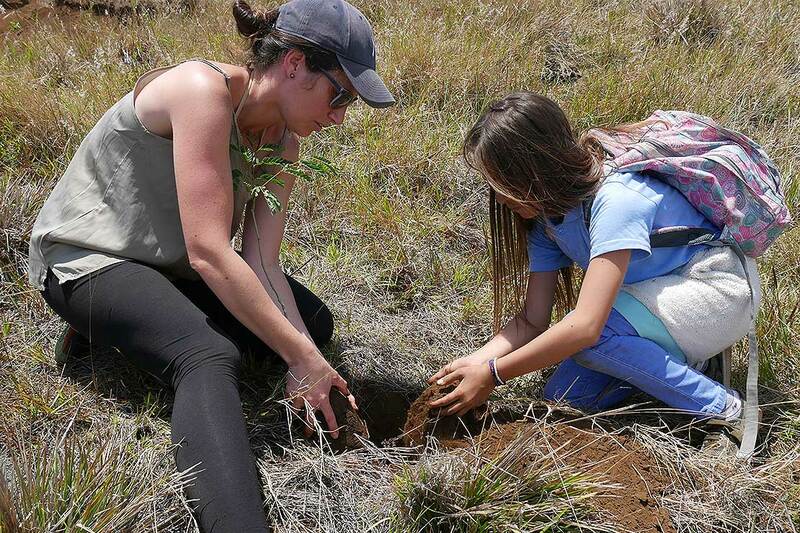 Groups of local school children joined around 80 researchers and scientists, who were all in the Hanga Roa, the capital of Rapa Nui, to attend an international conference on Pacific navigation and migration to plant more than 400 trees on the slopes of Poike, one of three extinct volcanoes on the island. Dr Flenley, who died in June this year, was well known among the Rapa Nui research community for his ground-breaking research on fossilised pollen. He established that there was a presence of the now-extinct Easter Island palm on the island. One of the Rapa Nui school children, 10-year-old Amanda Gonzales, says she was excited to be involved with the planting project. “We need plants so we can live,” she says. The more than 400 trees, a mix of Albizia Lebeck and Cassuarina Esquisipala, were chosen for their drought and wind resistant properties and have been growing in a nursery on the island for the past two years. Tahira Edmonds says it is hoped the trees that Conaf is planting will make a significant impact on stopping the erosion that is starting to affect the slopes of the Poike volcano. Dr Flenley was appointed professor of geography at Massey University in 1989, a position he held until his retirement in 2001.